General Considerations Jian-ping Chen SoLID-SIDIS Collaboration Meeting. 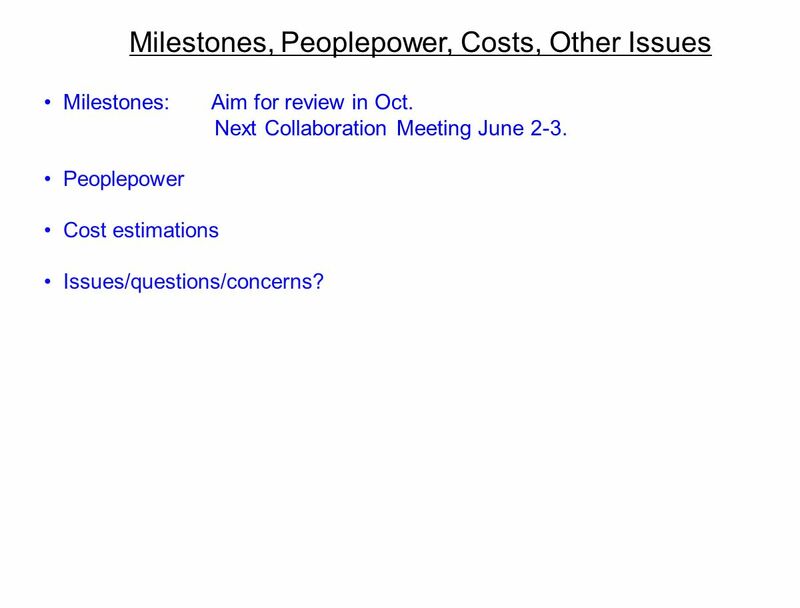 4 Milestones, Peoplepower, Costs, Other Issues Milestones: Aim for review in Oct. Next Collaboration Meeting June 2-3. Peoplepower Cost estimations Issues/questions/concerns? 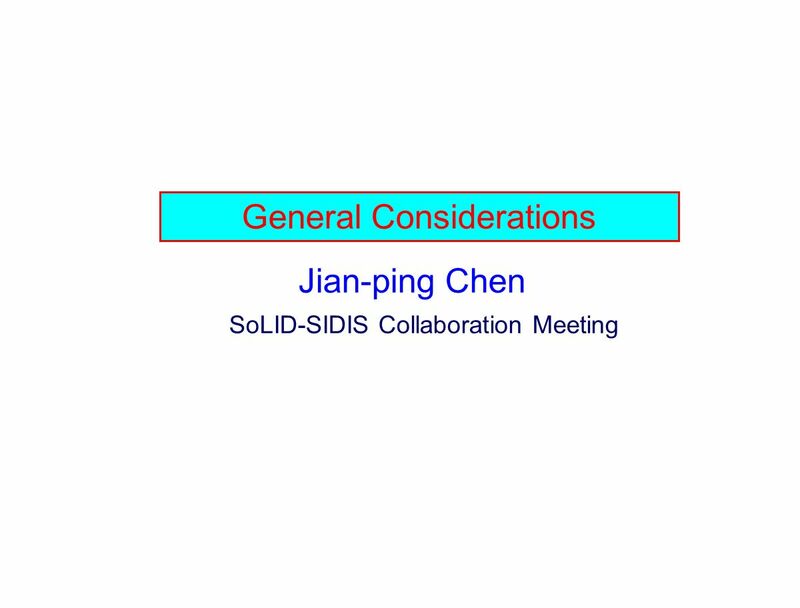 Download ppt "General Considerations Jian-ping Chen SoLID-SIDIS Collaboration Meeting." MADII Design and Physics Program Jian-ping Chen, Jefferson Lab Hall A Collaboration Meeting June 22-23, 2006 MADII Spectrometer Design Optics and background. G2p/GEp Preparation Overview Jian-ping Chen g 2 p /G ep Readiness Review 5/6/2011. NEUTRON TRANSVERSITY (E ) Haiyan Gao Duke University Durham, NC, U.S.A. ( SoLID Collaboration meeting June 2-3, 2011. SoLID Baffle and Background Update Zhiwen Zhao UVa 2013/05/23. 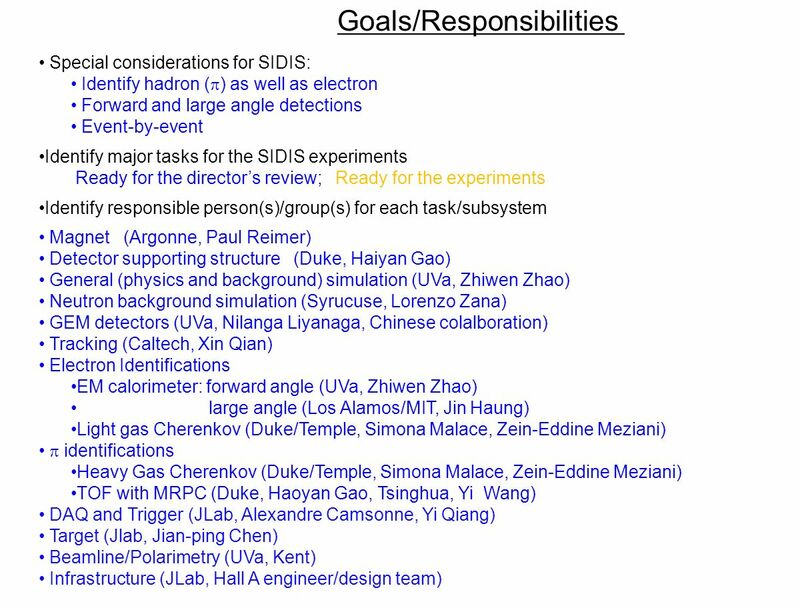 Future Sino-US Collaboration in QCD Phyics Ten-Year Anniversary of STAR-China Collaboration Haiyan Gao 高海燕 Duke University 1. 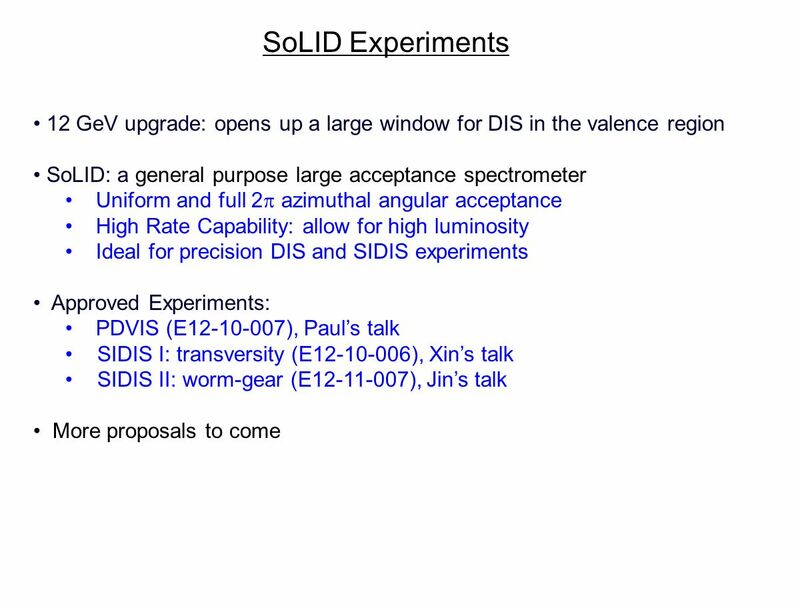 Jin Huang, MIT For the SoLID SIDIS collaboration. E : (GMp) Precision Measurement of the Proton Elastic Cross Section at High Q 2 Vincent Sulkosky Massachusetts Institute of Technology for the. SoLID SIDIS Update Zhiwen Zhao University of Virginia For SoLID Collaboration Hall A Collaboration Meeting 2013/12/17. Simulations of Single-Spin Asymmetries from EIC Xin Qian Kellogg, Caltech EIC Meeting at CUA, July 29-31, TMD in SIDIS 2.Simulation of SIDIS. R. D. McKeown Jefferson Lab College of William and Mary The Jlab 12 GeV Upgrade 1 R. McKeown - IUPAP - July 2, 2010. Wang Yi, Tsinghua University Joint meeting of HALL A and HALL C, SoLID status and Chinese contribution 1 Wang Yi Department of Engineering. Semi-inclusive DIS Physics with SoLID J. P. Chen, Jefferson Lab Hall A&C Collaboration Meeting, JLab, June 5-6, 2014  Introduction  Spin-flavor and SIDIS. SIDIS Cherenkov Detectors Haiyan Gao, Gary Swift, Simona Malace (Duke U.) Zein-Eddine Meziani, Eric Fuchey (Temple U.) SoLID Collaboration Meeting, October. 1 EIC Users Meeting, Stony Brook June 27, 2014 Request for these slides: Comment on “EIC working group activities at Jefferson Lab, and how people could. Prospects in neutron transverse spin study with a polarized 3 He Target at 12 GeV JLab Haiyan Gao ( 高海燕 ) Duke University/TUNL Durham, NC, U.S.A. A Third.